When the Italian epic fashion designer Valentino Garavani left his eponymous brand house that had already managed to garnish the red carpet with its grandiose and lavish frocks, which, by some miracle, almost always were there gracefully lodging on a celebrity’s body when she was taking that hoped-for Oscars statuette, no one could ever envision that the brand would find its worthy designers. However, Maria Grazia Chiuri and Pierpaolo Piccioli came down as if from heaven to keep on pampering us with various shades of red and just prettifying the earth. 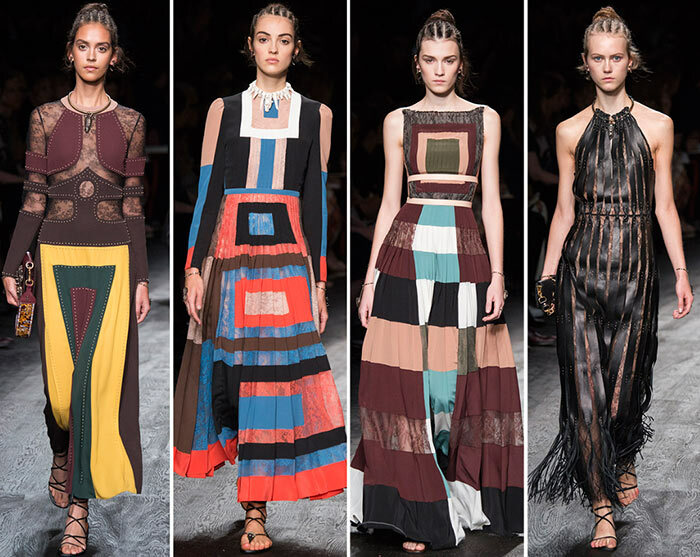 Today, they wowed us all with the Valentino spring/summer 2016 collection that has just graced the runway at Paris Fashion Week making us dream and giving us great aesthetic pleasure once again! 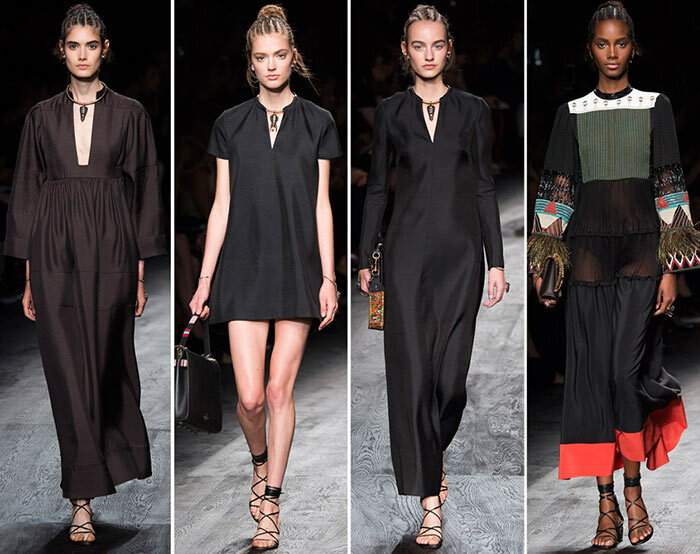 The Italian fashion designers are so intimately related to their motherland that they just cannot resist the temptation of every time injecting some Italian vibes to their ready-to-wear collections being staged during Paris Fashion Week. 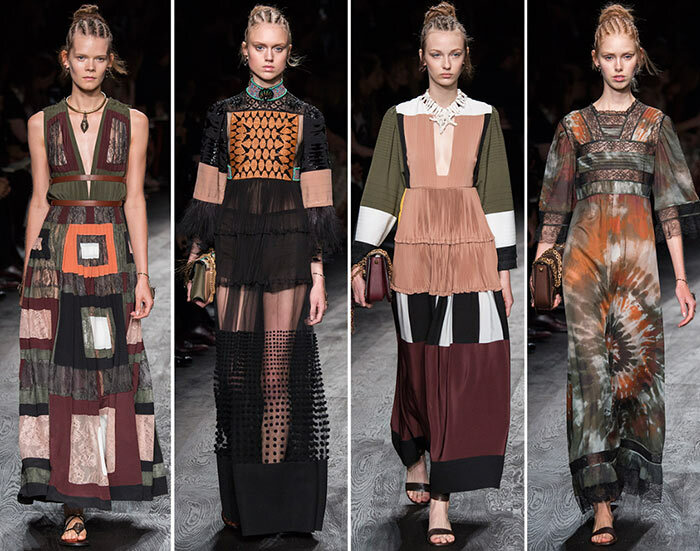 But the Valentino spring/summer 2016 collection seemed to have slightly deviated from flamboyant Italy nailing its attention to some African tribes, who are adjusted to live under the burning sun and who have worked out their appropriate dressing style. 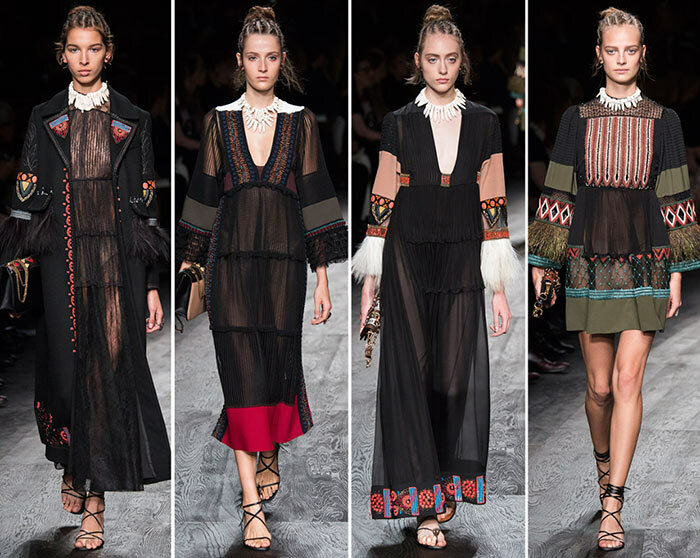 But if you are expecting to see some scandalous miniskirts scarcely covering female body or some crop tops from the Valentino RTW 2016 line-up, then you are definitely a tenderfoot to the army of Valentino fans. 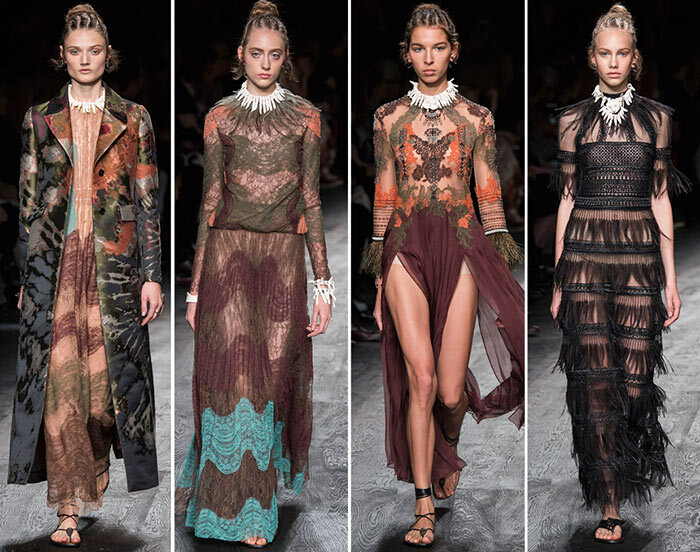 Maria Grazia Chiuri and Pierpaolo Piccioli just took their favorite Italian exquisite fabrics, carefully singled out some tribal details afterwards arranging them neatly or scattering casually on their canvas. The process was worth the result. 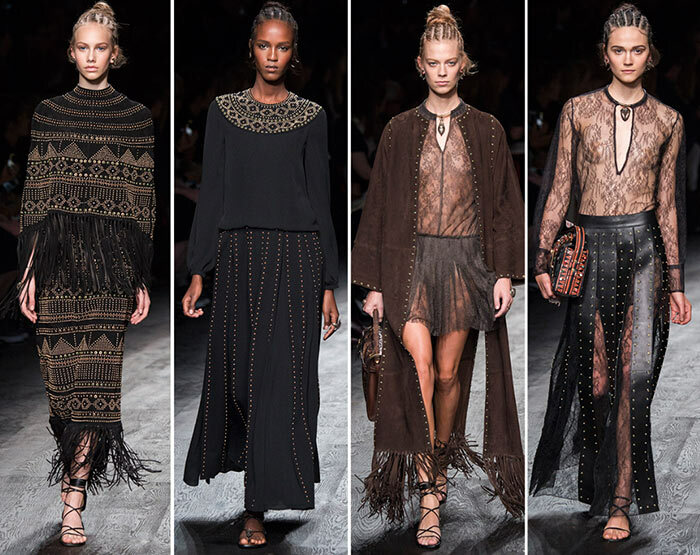 What we saw down on the runway today in the evening was in no way repeating other brands; even those trendy fringes and tassels were used in brand new ways and shapes. 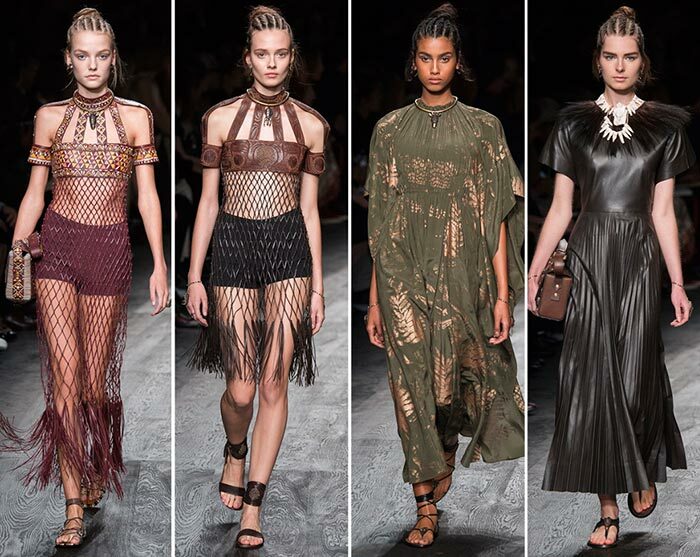 From the very beginning we got obsessed with the models’ hairstyles being tight cornrow braids stretching along the heads then piled up into buns and this was a wink that the show had much to indulge us with. 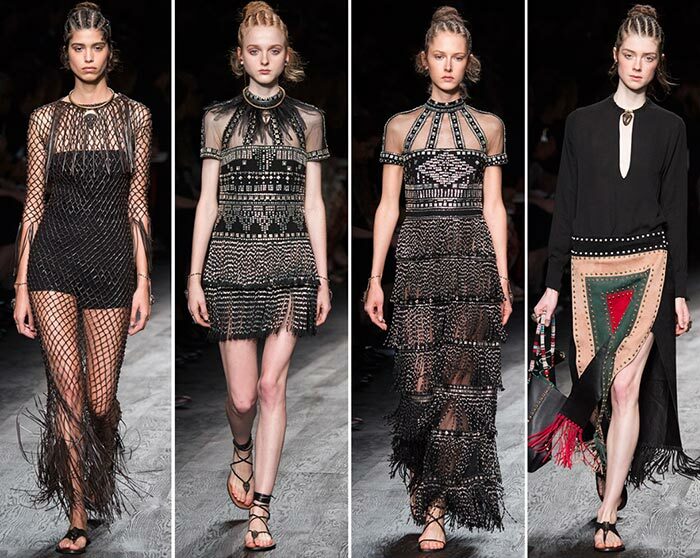 Monochrome coffee brown and black dresses embellished with metal round necklaces were soon to be followed by a number of black maxi and mini dresses that were decorated with some Aztec motifs, the sleeve cuffs or collars replaced with tassel details and the black organza fabric creating some mysterious body shades. 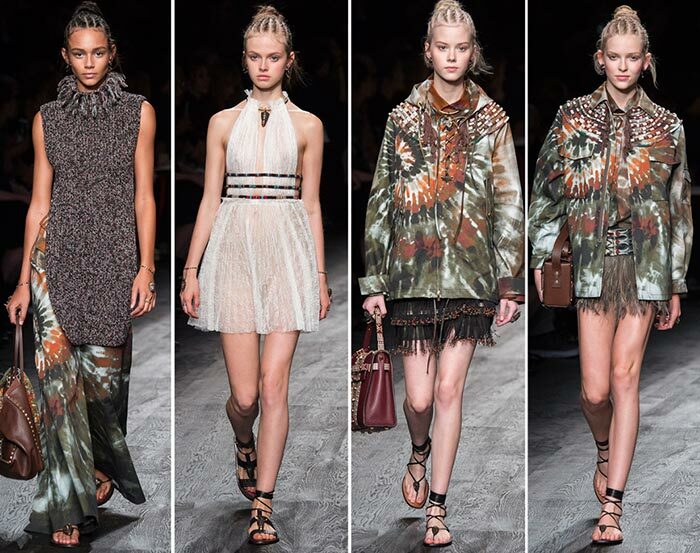 The ethnic twist of the ensembles was enhanced by ivory rustic necklaces. The Mikado yellow frock with long wide sleeves and deep rectangular neckline was far the most vivid color happening on the runway. 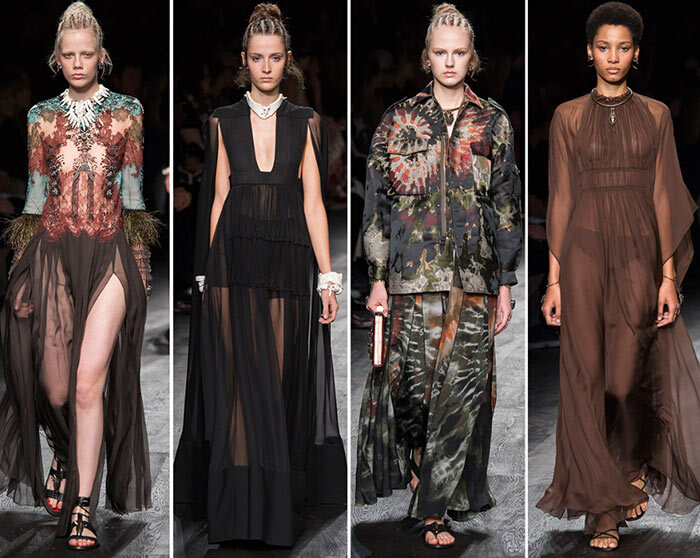 Then the runway got flooded by those fringed dresses that were imitating realistic waterfall cascades. We managed to resist the black ones but the multicolored cascade with knitted texture just hypnotized us threatening that it would never escape from our memory. 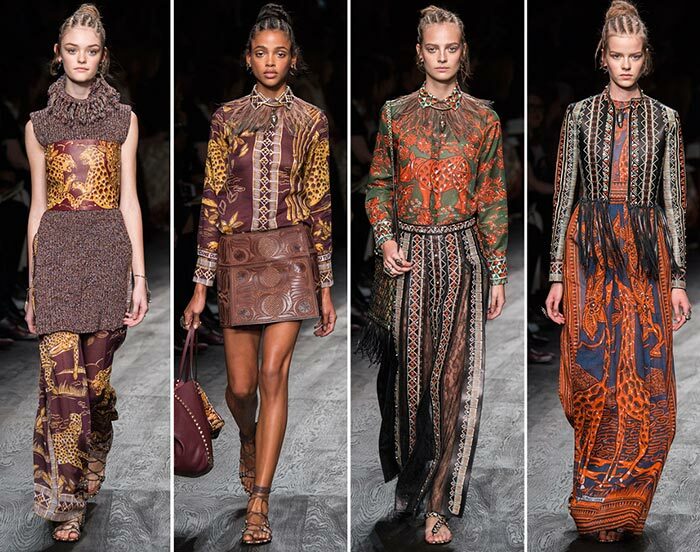 Apron dresses with multicolored roundish patters imitating marble parquets were enthusiastically competing with halter neck massive frocks styled with brown belts or tribal resin multicolored straps above the waist. Somewhere near another competition was under way and we could in no way orientate whether to prefer those frocks with leather panels united by diaphanous fabrics or those mesh fringed overlays worn over hugging bodysuits. But the most impressive and sumptuous was a car wash pleated black frock that was forwarded down the runway to demonstrate the power of the duo’s creative mind and sophisticated hands. Hundreds of similarly cut tiny suede pieces had been united on a transparent fabric to give birth to a super-extravagant dress that was provoking us to look at it over and over again. 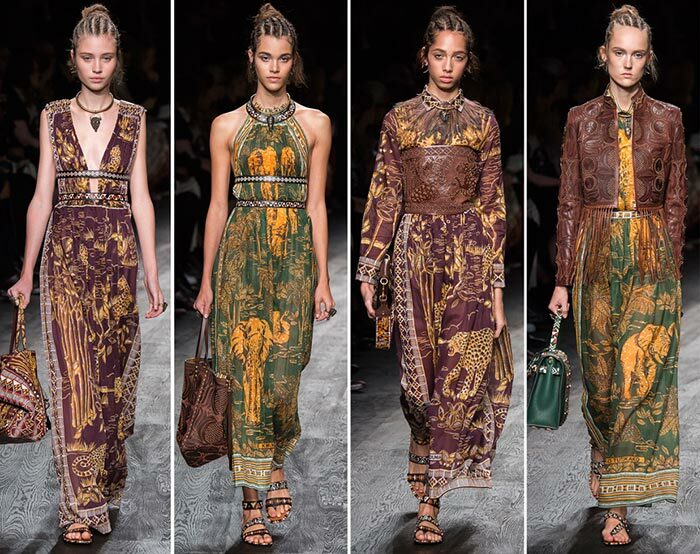 The designers had also epitomized African jungles on a number of pieces and as a result today right on the runway we witnessed some lions and tigers, some elephants and giraffes that were living on Valentino’s staggering frocks. 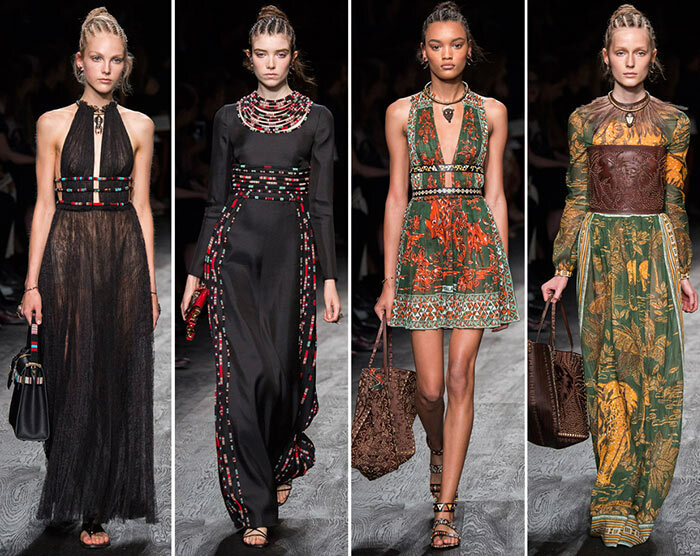 Everything in the Valentino spring 2016 collection from head to toe was emanating African vibes and we are heartily bowing to Maria Grazia Chiuri and Pierpaolo Piccioli for treating us to such upbeat and flamboyant frocks and ask them to deviate from their motherland more frequently.